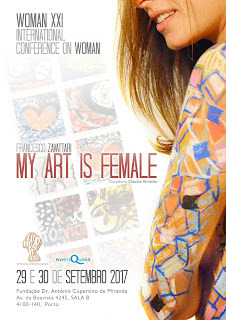 The itinerary of Francesco Zavattari's "My Art is Female" is being roamed in Portugal on this short but incisive 2-day journey at the Congress WOMAN XXI, International Conference on Woman, taking place at the Dr. António Cupertino de Miranda Foundation, in Porto, on September 29th and 30th. "My art is female" is an exhibition that results from the collaboration of the Italian plastic artist with the Portuguese association UMAR, in a campaign to prevent violence against women, held in the year 2015 and whose relevance has manifested through the numerous itineraries that have been taking place: after the debut at Quinta de Santiago Museum, in the Municipality of Matosinhos, the exhibition headed to Vila Verde (Municipal Library), Coimbra (House of Culture), Penafiel (Municipal Museum) and, more recently, in April, at the Galeria Piso Dois – Escola Secundária de Felgueiras. In his words, the artist says that "perhaps I am not the most qualified person to promote UMAR’s work because I have never believed that men and women are the same, I have always believed that women are ahead. Even so, I am very proud to have my art serve this reality in the hope that it can inject another antidote against all forms of brutality. " The congress, organized by EventQualia and whose scientific committee is composed of several professors and researchers from the Portuguese Universities, has as fundamental objective to gather all those who have something to say about Women in the most diverse areas - from Psychology, Economics, Education, Sports and Nutrition, the Arts and many others - to work on building a more in-depth and realistic knowledge of what it is, after all, to be a Woman today. During this two days of debates this exhibition can also be a reason for discussion, participating actively, provoking the exchange and sharing of ideas among all the participants, through the powerful visual language of Francesco Zavattari.